On August 6, 1945, the US dropped atomic bombs on the Japanese city of Hiroshima, following up three days later with another bomb on Nagasaki. 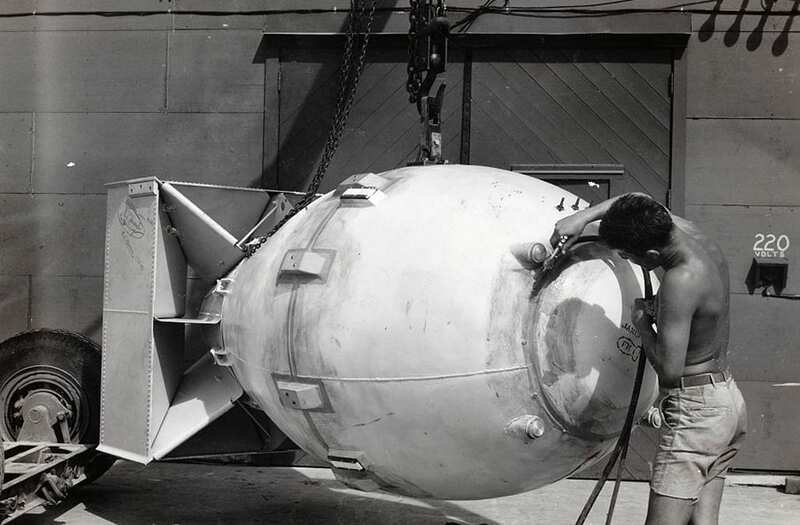 The bombs, known as "Little Boy" and "Fat Man," were loaded onto bombers at the North Field airbase on Tinian Island in the Northern Mariana Islands, which are south of Japan. Until recently, few photographs of the run up to the attacks were available. But declassified pictures shed light on the preparations for the bombings — the first and only wartime nuclear bombings in history. While seemingly mundane, these photos show us what it was like to prepare for one of the most important moments in modern history. On the left, geophysicist and Manhattan Project participant Francis Birch marks the bomb unit that would become "Little Boy," while Norman Ramsey, who would later win the Nobel Prize in physics, looks on. The bomb is then escorted to the nearby North Field airbase on Tinian, shrouded by a tarp. Workers check "Little Boy" one last time, keeping the tarp on for security reasons, following a lowering procedure similar to the one done for "Fat Man" three days later. From there, both "Little Boy" and "Fat Man" were flown over Hiroshima and Nagasaki, respectively, dropped, and detonated. On August 15, Japan announced its intention to surrender, signing formal documents to that fact on September 2, ending World War II. First seen on AlternativeWars.com. An earlier version of this post was composed by Christian Storm.